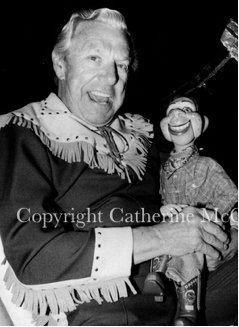 item 1 >>> After my lengthy Clarabellaplooza posting a while back, I vowed to never again do that much research…until I found one amazing picture on the net, and I knew I had to, this time with Howdy Doody himself. I mentioned there were 8½ Howdys, meaning actual physical puppets. But as I dug into it, it became obvious there were many more…a dozen? 2 dozen? Who knows. 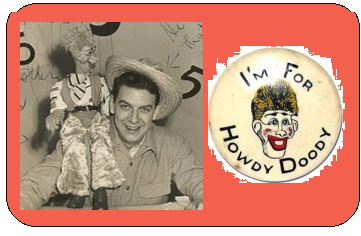 As one of the foremost HD experts and collectors Burt Dubrow once said: “Since 1948, replacing puppets and puppet parts was a steady industry.” But here’s an interesting fact: Howdy Doody was named by…the kids! made his first appearance on the 4th show…and this was when they were still on just once a week, Saturdays at 5PM, for one hour. 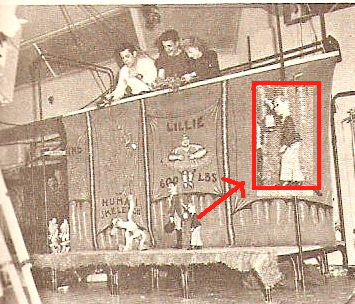 Here and above we see the original Howdy Doody. One of the first running plot-lines was his campaign for “President of the Kids,” and its popularity convinced NBC to put the show on 5 days a week. Meanwhile, Macy’s approached Paris about producing a HD doll they could sell. But who owned Howdy? NBC said they did, and Paris said OK, fine, and literally his took puppet and went home, never to be seen on the show again. to make the face more expressive. Velma said that would alter the look too much, but they said do it. So she did, and when the back-up arrived, sure enough, it wasn’t quite Howdy. item 5 >>> The Transplanted Head…Now Velma was out in Hollywood, so a local NY craftsman named Scott Brinker was called on to help. He had done props for the show, and they asked him if he could do puppets…Sure! he said…and went to the library for a crash course. He turned the new head into John J. Fadoozle, American’s #1 Boing! Private Eye…seen here in his original zoot-suit getup…he would eventually wear a Sherlock Holmes-type outfit. 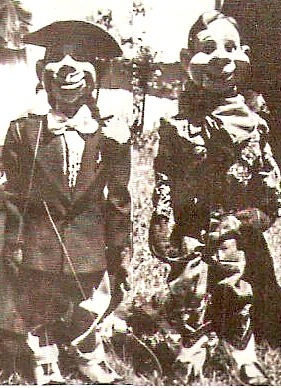 (I was counting the Inspector’s head as ½ a Doody, sorry…) Brinker also fashioned a duplicate Howdy, and would be the show’s puppet-maker for the duration. Once again, writer Eddie Keen came up with a clever way to use the duplicate…turns out HD’s mysterious opponent in the election was his twin brother Double Doody! They did that so that every vote would be for Howdy, and he couldn’t lose. Modern candidates take note. item 6 >>> After the Massacre…That’s the Christmas Eve Massacre in 1952, when most of cast was fired…see 1/13 for the details. Puppeteer Rufus Rose was hired…he immediately restrung HD with thinner gauge wire, and also built Photo Doody. Now when Buffalo Bob, Clarabell and the gang made public appearances, Howdy usually wasn’t with them. It was awkward to work the puppet in a department store setting…and even for publicity photos, Howdy was hard to pose. 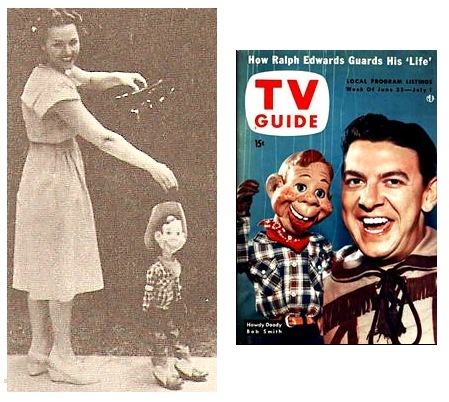 Photo Doody was the answer…he was not a real marionette, altho as we see here…Photo’s on the left, the real Howdy on the right…he could be fitted with strings if the shot called for it. The key was, Photo Doody’s limbs had ball joints, and could hold a pose in any position. See today’s Stolf’s Blog for 2 more typical poses. (BTW, this picture of the 2 Howdys was the one I alluded to in item 1.) 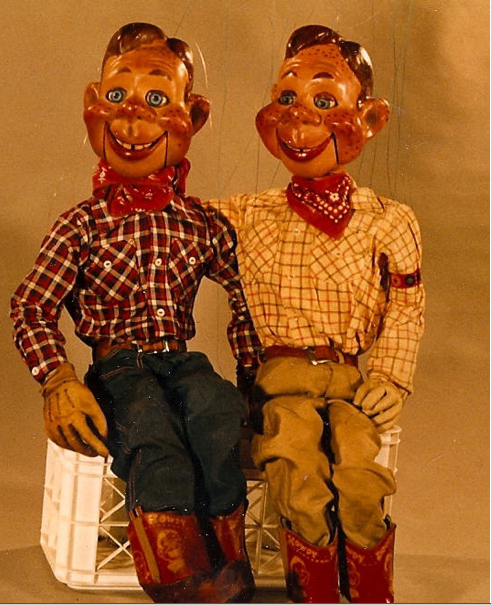 These 3 original puppets still exist: the “real” Howdy resides at the Detroit Institute of Art…Double Doody is at the Smithsonian…and Photo Doody belongs to a private collector, sold at auction for $113,000. The original “Ugly” Howdy was destroyed as part of a settlement with Frank Paris in 1955.
item 7 >>> International Howdy…The Internet has some incredible sites devoted to specific areas of Baby Boomer popular culture…especially TV and music, but really, running the gamut. And not for nothing, but I’ve contributed to a few of them. 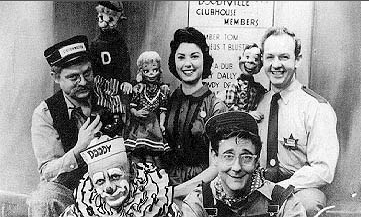 The odd thing is that Howdy Doody isn’t one of them, perhaps because he’s late 40s and 50s, not 60s. I honestly don’t know the reason, and when it comes to the foreign spinoffs, there’s virtually nothing out there. 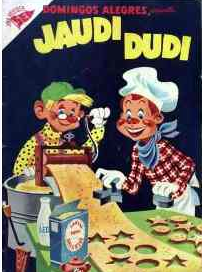 I can tell you that a Spanish language version of the show called “La Hora de Jaudi Dudi”…the Howdy Doody Hour…went on the air in Mexico City and Havana, Cuba in the Spring of 1953, but both were gone within 6 months, proving too expensive to produce. It’s taken for granted that both shows had a copy of Howdy…probably some other characters too…and one story circulating is that he had no freckles, which sort of makes sense…the American HD had 48 freckles, one for each state. 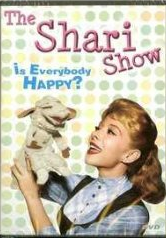 Another tale told is that the Mexican show substituted a police dog for Clarabell, on the grounds the kids there would find that funnier. Don’t ask, cuz I haven’t a clue. But we do have a lot more information about the Canadian Howdy franchise. item 9 >>> The Seventies are Dead to Me…But why in the name of the Ooragnak they made a completely new puppet, with real hair, for the 1970s revival series is beyond me. The less said about that the better. 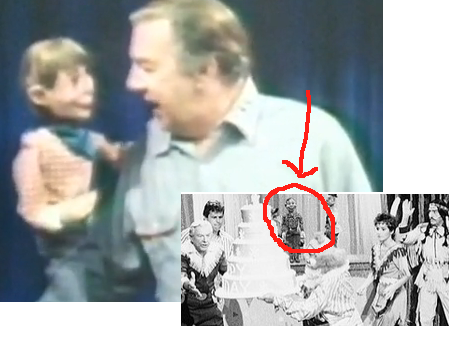 Altho we can see in the smaller photo that Howdy was back to his old self on the 40th Anniversary Special, aired in 1987.
used for public appearances during the last 15 years of his life…he died in 1998…and that’s probably it in this photo. Then there’s the strange case of Claude Rae. Trolling the net, I found him on an episode of The New Hollywood Squares from 1987…hosted by John Davidson, with Tia Carrere, Richard Lewis, Jimmie Walker, Brenda Vaccaro, Shadoe Stevens, Phyllis Diller in the Center Square for gosh sakes! And it said Claude Rae “as Howdy Doody.” Wha–? OK, Buffalo Bob Smith was also in one of the squares on that show, and it turns out Rae did the voice of Howdy for the Canadian version, so perhaps that explains it, kind of, sort of, I guess…Kowa-Sheesh! This entry was posted in \baby boomers. Bookmark the permalink. You have double doody written up as photo doody. I very much enjoyed your page. Nice effort.